Norman Reedus turned 44 years old today, and he has become one of Walking Dead’s biggest stars playing the role of the character Daryl Dixon. He has gathered a following, and fan base, that would rival Andrew Lincoln’s character Rick Grimes. 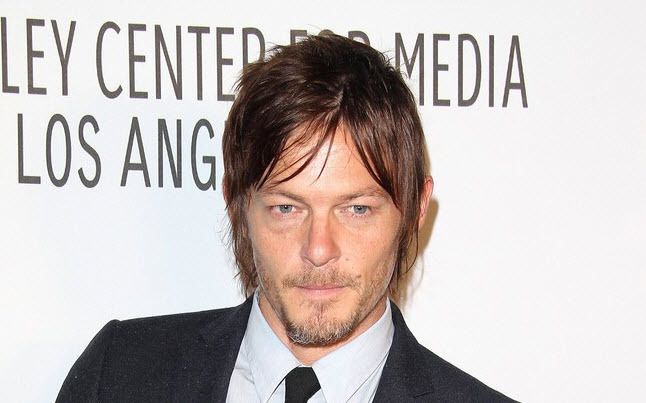 Norman Reedus plays a character known as Daryl Dixon who has a grittiness and ruggedness about him that draws fans in. He is often known by his weapon of choice that has become part of his character in the show, the crossbow. The other part of the character that sets him apart is his choice of transportation, his motorcycle. Norman Reedus was born in Florida, where he lived only a few months before moving to Los Angeles, California. He also lived in several cities in several different countries including Japan, Britain, and Spain. When he first came to Los Angeles, he worked at a Harley Davidson shop in Venice and at the same time contributed artwork to various shows as a painter, photographer, sculptor, and video artist. He got his first taste of acting in the play “Maps for Drowners” at the Tiffany Theater on Sunset Boulevard. Days later, he was cast in Mimic (1997), then in Six Ways to Sunday (1997), and Floating (1999). He then on to do many other films including The Boondock Saints (1999), Deuces Wild (2002), Blade II (2002), Let the Devil Wear Black (1999), Gossip (2000/I), Moscow Chill (2007), The Notorious Bettie Page (2005), and many others. Nunca vi ator mais foda cara! awesome! well done. loved it! happy birthday ! wish u a very fantasticone! Happy birthday norman , daryl. Dixon , the. Best , !! !